Warning! 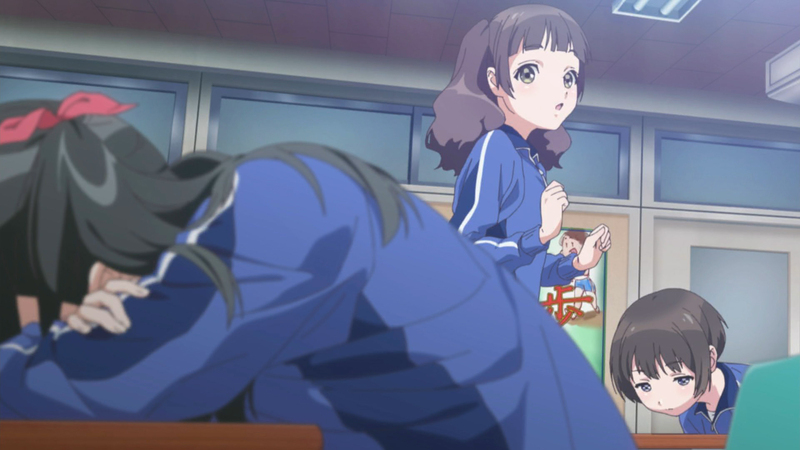 The following article contains spoilers for Wake Up, Girls! New Chapter Episode 1. If you don’t want to be spoiled click away now! The original concept for Wake Up, Girls! was definitely an interesting one – present an idol group that fans can follow over time and show their growth and progression in what is an overloaded and very competitive industry. Of course, the anime fictionalises the real life idol group, but it is known for taking a more critical view on the idol industry, not being afraid to show how tough it actually is. This new series is a follow up to the two movies that followed the first season of the anime, which unfortunately weren’t readily available in English, so if you’re a casual viewer or have been out of the loop since season 1 finished airing there’s a gap of knowledge there from what the series expects you to have. Thankfully these gaps are filled in slightly in the introductory episode, particularly with the movement within I-1 Club. The top idol group now has a new center, while several older members have split off into sister unit Next Storm. Wake Up, Girls! however don’t seem to have moved on much from their humble beginnings. 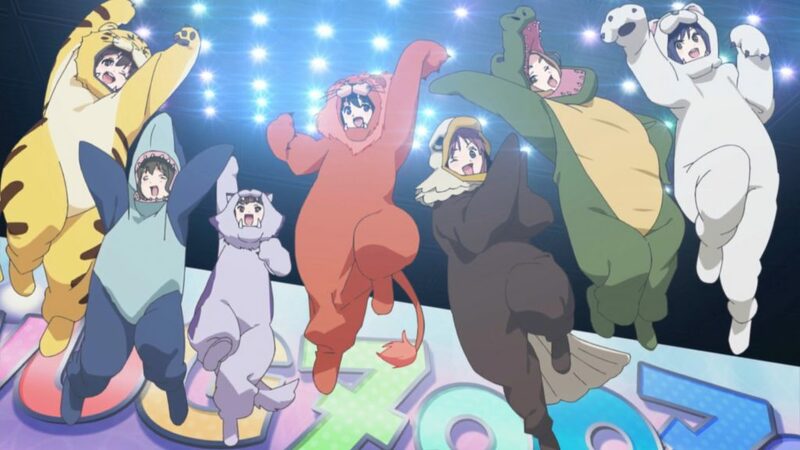 Their main jam is the WUG Zoo TV program (which got a real-life series of animated shorts, interestingly enough) and other occasional TV appearances. Despite not doing much, they still have their fans, and we are immediately introduced to three of them in a strange opening sequence that turns out to be a video of a dance cover they did. This seems a strange way to open the series, but there’s more going on here as these three schoolgirls are clearly being lined up to join the group from the amount of screen time they get. Which is interesting considering the backdrop of this series is put against a decline in the idol industry. It’s hard times with an economic crunch going; and while Wake Up, Girls struggles along as a local idol group, I-1 Club have taken the decision to shut their Sendai theatre. This is actually a fascinating idea to explore in terms of the series retaining its critical approach to idol culture. It’s not clear whether this is just a general money problem or due to market oversaturation; but if it is the latter it could offer a reflection on the real idol industry, which, if not past that point already must be pretty close to it. If you’re paying attention you’ll also notice them in the title card. Helming this new series is animation studio Millepensee, who have taken over from Ordet who produced the franchise up until the second movie, Beyond the Bottom (which Millepensee co-produced). This transition brings with it a very divisive new art style, with the franchise’s more realistic look dropped for something a lot brighter and cuter. The change feels like they are trying to appeal to a wider crowd and capture some of the audience from the likes of Love Live!. Whether it has worked we’ll have to wait and see but considering Wake Up, Grils! darker past it is a huge and admittedly jarring change. At times it feels far too happy and moe which detracts from the tone the plot tries to set out. We’ll probably going to get used to it in time, but at the moment there’s just something that doesn’t sit right with it. But that’s nothing compared to how messy this first episode has been cut. There’s a sharp cut in between each scene and the jump between sequences takes you out of the episode entirely. It’s like hopping between different countries if you were able to teleport between them. While the plot progresses towards a TV show appearance alongside I-1 Club, getting there is a slog. Then there’s the mad camera work on the CGI dance sequence, which flies and cuts about all over the place in an effort to try to make the sequence more exciting when it doesn’t need to be. Considering Millepensee is the studio behind the most recent anime adaptation of Berserk, which was heavily criticised for its poor CGI, it’s surprising that this hasn’t set off more alarm bells than it has. To be fair the CGI here isn’t too bad – not up to Love Live standard – but passable all the same. Once they iron out the runaway camera it shouldn’t be too bad. Looking at what Millepensee have done previously, it’s not too dificicult to wonder if this is all down to lack of experience more than anything else. Other than Teekyu, which is a 5 minute gag show, and Berserk, all they have really down is a lot of in-between animation work for other anime. Hopefully things will improve as we go on, but it’s certainly not a perfect start. What we can say so far is that despite not being technically up to scratch, Wake Up, Girls! New Chapter does have potential. 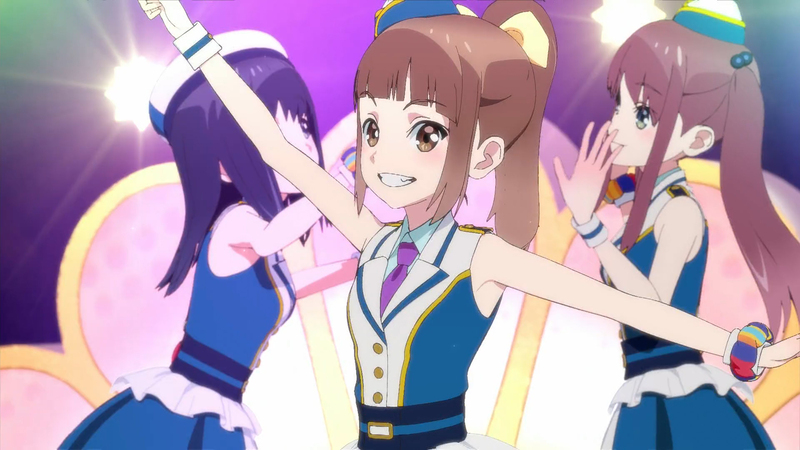 The story about the decline of the idol industry seems really interesting and it has new additions to its cast of characters to help shake things up. It’s hard to see it eclipsing Love Live! Sunshine!! this season in terms of quality and popularity, but fans are sure to get a kick out of it.